We arrived in London just yesterday, and already we are slipping into a comfortable pace in the city. This morning we headed out on a Tower of London Kids Tour with Context Travel to really grasp the history of one of the city's cornerstones. Our tour began in a spot that any young boy can appreciate, the exact location where they carried out the numerous executions on Tower Hill for those condemned to death at the Tower of London. Our informative guide Emma was a delight from the very beginning, constantly involving and engaging the boys with questions, trivia and unique facts of the attraction itself. That is what I loved most about our Context Travel tour. We have been on our fair share of tours in the past, but few have come close to bringing the kids into the loop as much as the Tower of London Kids Tour. Emma took us on a tour of the Tower of London which included a look at the Crown Jewels (no photos allowed), and let me just say, "Holy diamonds Batman!" There was a diamond in there consisting of more than 500 karats that was nearly the size of my fist! The call of the infamous tower ravens made for steady background noise throughout the day and provided an opportunity to close your eyes and pretend that you were wandering the brick paths over 900 years ago. If you have never been to the Tower of London yourself, it is not simply one tower like I had believed at one time. Instead, it is a collection of towers, residences, a walled city within itself. The history found here is beyond imagination to a person coming from a country that itself is so young. Standing in the spot where Anne Boleyn was beheaded, seeing the small chapel where Henry VI was brutally murdered and even seeing the site of the ancient wall built by the Romans was an incredible chance to step back in time and really dive into living history with the boys. Originally, the Tower of London consisted of just the White Tower erected by William the Conqueror in 1076. Today, the White Tower is one of the most heavily visited parts of this attraction, and includes a series of displays on the armor of past monarchs, as well as weapons of the day and even the ability to visit the Tower's dungeon area. Free live action tours are held throughout the Tower during the day by guides in period costumes, and it is fun to follow along with them and join in the "acting" if you have a chance. A walk along the ramparts is also a fantastic way to take in views of the Thames River and Tower Bridge during your visit as well. 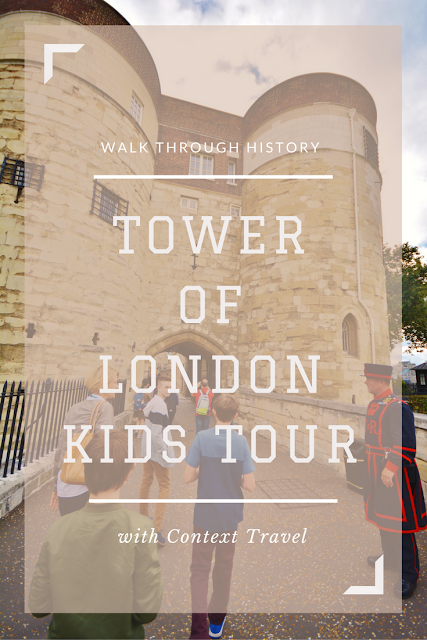 If you are looking to tour the Tower of London with kids, there is no better way to do it than with a Tower of London Kids Tour from Context Travel. Their attention to detail and individualized attention is hard to find anywhere else and leads to an experience that is both fun and educational. For more information on this and other family tours available from Context Travel around the world, visit the Context Travel site. Stay tuned later this week as we go to explore the British Museum with another Context Travel guide!